No more tedious compilation runs. 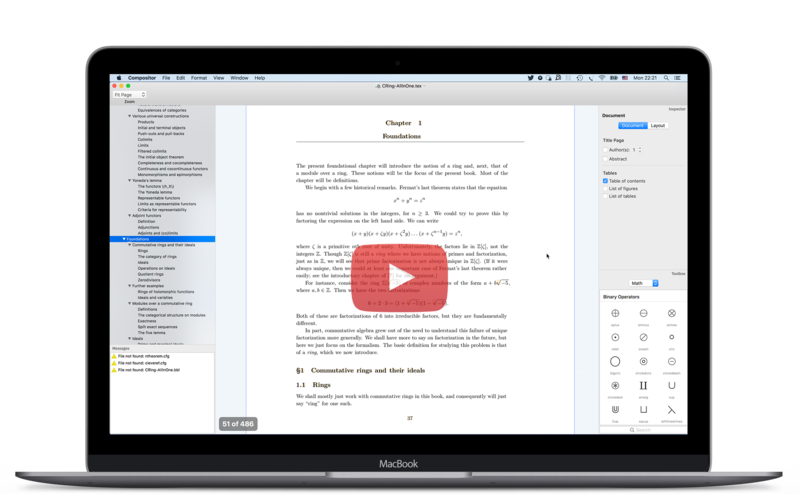 Compositor typesets and renders your LaTeX document on every single keystroke. Compositor's WYSIWYG user interface offers a document outline, inspector panels, and other conveniences you'd expect from a modern word processor. The app comes with its own LaTeX distribution built right in. No need to install any additional software just to get going. This is LaTeX without entry barriers. This not just gives you immediate visual feedback, it should also save you quite some time previously spent on compilation runs. There will be situations where you want direct access to the underlying LaTeX source. 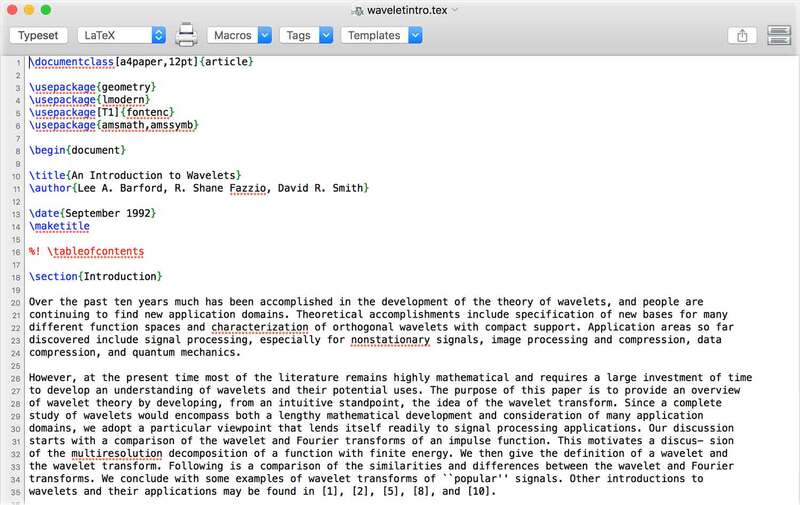 Pressing Ctrl+S will open an inline source editor showing the LaTeX source behind the document region you're currently working on (often this will be the current paragraph). This should allow for a smooth migration experience to this new paradigm, even with commands or environments for which there is no dedicated graphical inspector (yet). If your document uses LaTeX packages not bundled with the app, they are automatically downloaded from CTAN. And if you are using packages not available on CTAN, you can still provide them to the app easily. Compositor reads and writes regular, plain text .tex files. This means it's compatible with your existing LaTeX documents. Also, there's no lock-in of any kind — you can switch between Compositor and other tools at any time, since there's no proprietary file format involved. Download a trial version now and give it a try! The trial will run for 30 days without limitations. This should give you plenty of time to evaluate the product. I would like to point out that despite the version number, Compositor is still lacking in many respects, so please evaluate the product to see if it fits your needs. Here's a list of current limitations. Also be sure to check out the public roadmap and issue tracker for more information on planned features and known issues. All purchases include lifetime updates. Buy once, get all updates for free, major version updates included. Feedback of any kind is appreciated. Also, if you encounter any issues, please let me know. You can reach me by email at support at compositorapp dot com or via Twitter. For news and updates, follow @compositorapp on Twitter, and check back on the blog every now and then.